Tennessee -- The Vols face four SEC East foes coming off their bye weeks in UF, Georgia, South Carolina and Kentucky. Basically, 4 of 5 SEC East opponents get a breather before facing the Vols. That's brutal scheduling, and I love it. Florida -- Arkanasas, Vanderbilt and LSU each get an off week before facing the Gators. The LSU game is sort of balanced out by a get well break before facing UT. The Gators also have a break before UK. Alabama -- Auburn, Mississippi State and Ole Miss all have a week off before playing the Tide. The Iron Bowl shouldn't be impacted because both teams have that week off. In other words, a great Tide friendly flow of off weeks. Auburn -- Alabama is the only SEC team has a bye before playing Auburn. The Tigers also have a bye before the Iron Bowl, and they get 12 days of rest to get ready for their trip to Morgantown (Thurs Night game) followed by nine days to get ready for Ole Miss. The bye weeks work out extremely well for the Aubies. LSU -- No SEC teams have an off week before playing LSU. The Tigers get a bye before their games against UF and Ole Miss. South Carolina - No one gets a bye week before playing SC. The Gamecocks get their own bye weeks before facing Tennessee and Clemson, but they have to face LSU, Tennessee, Arkansas and Florida to close their season. There's nothing positive about their scheduling structure. It's just too back loaded. Or put it this way...I don't think the SEC did the Vols any favors. The off week before facing UGA last year saved their season. They'll pay for that this year. Off the subject just a little but I think our bye weeks worked out pretty good. Ideally we'd like to have one between LSU and UF but they come at good times. The one between Bama and UT is very good timing. Coming off that stretch of @So.Car., @ASU and vs. Bama a bye week will be nice before playing the Vols. And the bye week after Auburn gives us a little break before tech and the post-season. Anyway we play stretches of 5 and 6 games before by weeks, which isn't that bad. Look at So.Car. schedule where they play 8 games before a bye or UT who gets a bye in week 2 before playing 9 consecutive games. If there is anything favorable about our schedule I woudld say it's the bye weeks, IMO. Tennessee didn't do themselves any favors either by moving their game with UCLA to September 1st, thus requiring them to fill their previous open week before UF with the UAB game. Now they get to rest up for the Blazers and the Commodores this season. Nice work guys. Bye weeks are completely overrated. TN saved their season last year by hammering a listless Uga squad that gave no effort. 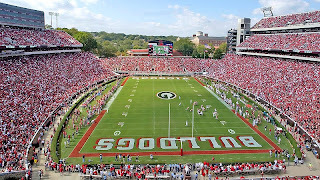 They could have done that any week of any season considering the product UGa put on the field that game. I'm in favor of no bye weeks for anyone before conference games. We've been on the bad end of bye deals too many times. Man up & play 'em straight through! I think the numerous bye weeks Florida had when SS was there cost us dearly. When we were wearing them out the reverse was true. I think our AD should pay a lot of attention to the subject.